This one's for all the adults out there, doing their best to survive the hot summer sun. Whether you're having a cook-out, relaxing by the pool, or doing some sweaty yard work, you deserve a little frozen glory on a stick that's made just for you. 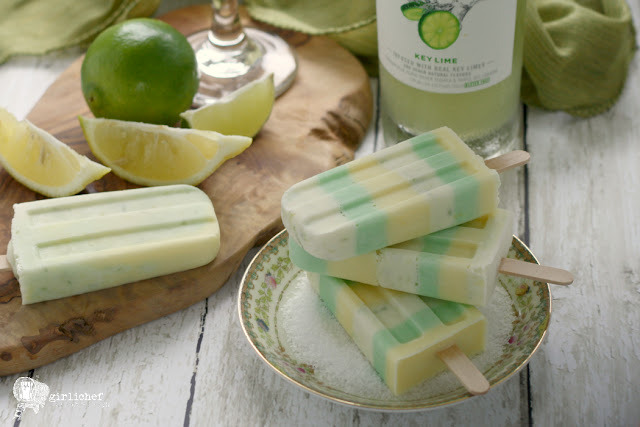 In case you're wondering what "frozen glory on a stick" is, well...it's an icy cold popsicle that is sweet and creamy and tangy and boozy ALL AT THE SAME TIME! Kids shouldn't be the only ones running around with sticky chins, hands, arms and permagrins without a care in the world. You know, for at least a solid five minutes...because that's about how long it takes before those cares come rushing back full-force. It's a magnificent five minutes, though. 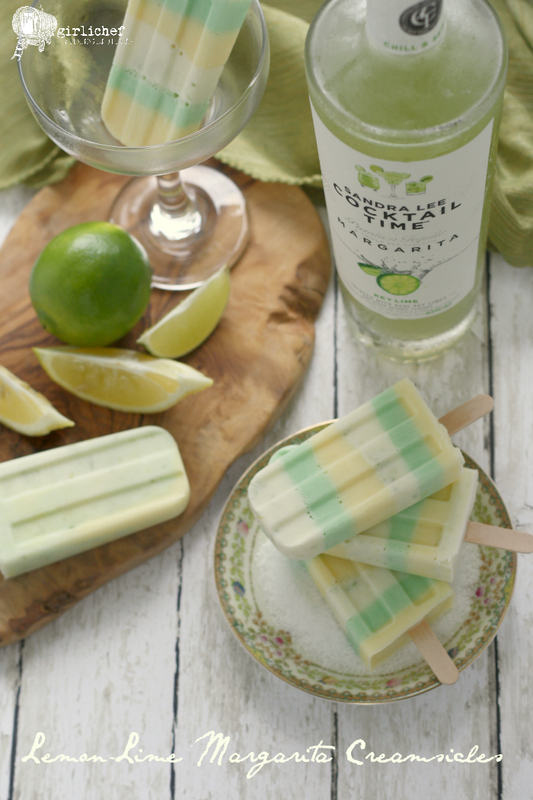 These boozy pops feature the new Sandra Lee Cocktail Time™ Margaritas. What are these margaritas I speak of? Well, after doing her research (aka testing all of the pre-made and ready-to-serve margaritas and cocktails on the market) and finding it hard to name one that consistently tasted great, Sandra Lee decided to develop her own line. 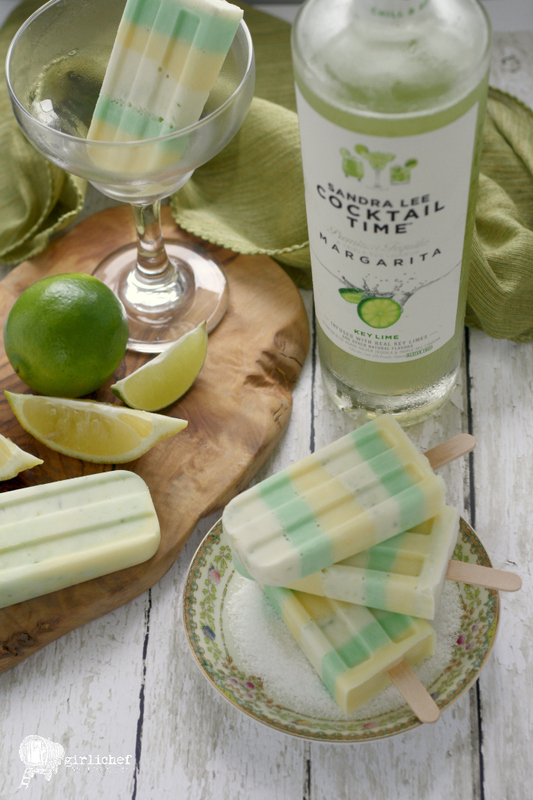 Available in key lime and strawberry flavors, they are infused with real fruit, pure cane sugar, premium blue agave silver tequila, triple sec liqueur, and other natural flavors. Sound good? It gets better. Not only are the margaritas versatile and ready to chill and serve, they're also gluten-free and have less than 150 calories per 4 ounce serving. 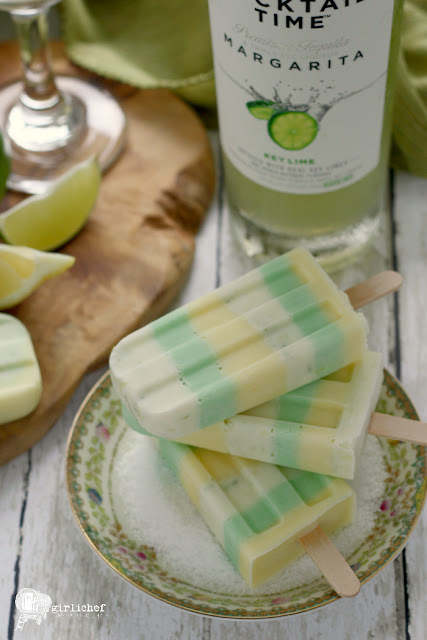 It's definitely handy to keep a couple of these bottles in the fridge for impromptu summer get-togethers—but also for making some boozy adult pops to add a little whimsy and fun. Ice cold drinks and ice cold popsicles. That's what summer's all about. Whip up a batch of these and keep them in the freezer. Next time the melodic tinkles of the ice cream man make their way through the air, hand the kids your spare change...while you head into the freezer to grab your own frozen treat—adult style. Satisfy all of your urges while beating the heat with this Lemon-Lemon Margarita Creamsicle recipe; it's sweet, tangy, creamy, cold and boozy all on one stick! You will need three small bowls or larger measuring cups with spouts to make the 3 separate layers. In the first bowl, whisk together 1/3 cup heavy cream, 1/4 cup freshly squeezed lemon juice, 2 tablespoons (1 ounce) Cocktail Time Key Lime Margarita, 1/4 teaspoon vanilla, and yellow food coloring. In the second bowl, whisk together 1/3 cup heavy cream, 1/4 cup freshly squeezed lime juice, 2 tablespoons (1 ounce) Cocktail Time Key Lime Margarita, 1/4 teaspoon vanilla, and green food coloring. In the third bowl, whisk together the remaining 2/3 cup heavy cream, 2 tablespoons (1 ounce) Cocktail Time Key Lime Margarita, 1/4 teaspoon vanilla and the lemon and lime zests. Pour a little of one of the mixtures into the bottom of 9 (2.5 ounce) popsicle molds. Freeze until solid, ~1 hour. Repeat until all of your creamsicle mixtures have been used, making sure to add popsicle sticks at the correct time for your mold (I usually add when the liquid is about 1/3 of the way up); pouring slowly and carefully once the sticks are in. I recommend making the layers fairly thin (less than 1/2-inch each), and using equal amounts of each mixture for proper flavor distribution. Simply whisk all of the ingredients together in one large measuring cup with a spout. Pour into 9 (2.5 ounce) popsicle molds and freeze until solid, adding your popsicle sticks once the mixture has started to set (60-90 minutes into freezing). The yellow and green layers add a nice little burst of tang. Taste them before you use them, and if you prefer them sweeter, add a little more simple syrup. To make a vegan creamsicle, substitute full-fat coconut milk for the heavy cream. I received a couple of bottles of Sandra Lee Cocktail Time™ Margaritas at no cost via thebar.com. I was not compensated for this post. All opinions are my own.